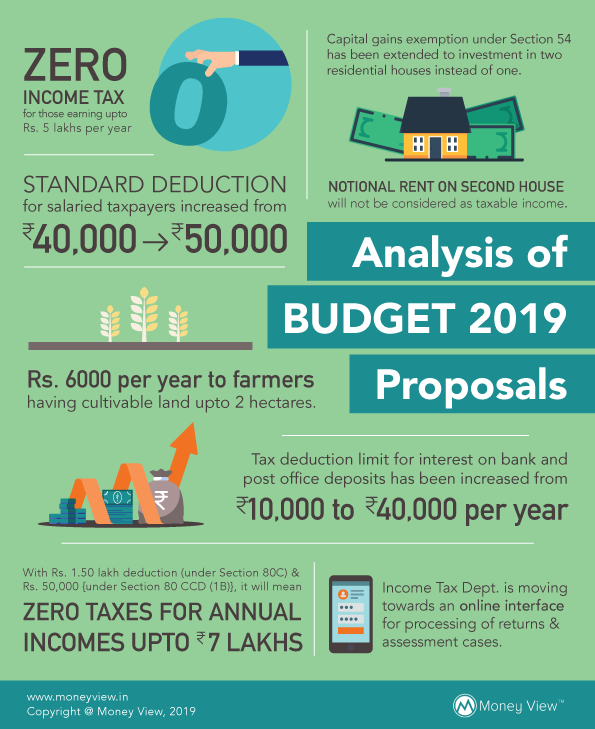 The Interim Budget 2019 has been hailed as pro-rural economy and pro-middle class. Considering that it was just a Vote-on-Account and not a full-fledged budget, it was not expected to contain any significant announcements. But at the same time, a pre-election budget could not have been a non-event either. Keeping that in mind, Interim Budget 2019 has certainly taken some steps to address the concerns in the economy, especially the agrarian crisis. As soon as the Interim Finance Minister, Piyush Goyal, announced that all the taxpayers with net taxable income of less than Rs. 5 lakhs will be provided complete tax rebate from the next year, the Members of Lok Sabha started thumping their desks. Such a reaction was unprecedented especially in the recent history of Budget presentations. While the announcement was seen to be of immediate benefit to all taxpayers, fine print revealed that the Govt. had not increased the basic exemption limit, but instead provided a tax rebate. What this actually meant was the fact that if your taxable income is Rs. 5 lakh, you are eligible for a tax rebate of up to Rs. 12,500 (5% tax rate as per the first tax rate slab up to Rs. 5 lakhs). However, the moment your income crosses Rs. 5 lakh, you will not be entitled to this tax rebate u/s 87A of the Income Tax Act and hence, be liable to pay full tax. * tax calculated on the basis of budget 2019 proposals. With an eligible deduction of Rs. 1.50 lakh under Section 80C and an additional deduction of Rs. 50,000 under Section 80CCD(1B), an individual earning Rs. 7 lakh can still end up paying zero tax. This move is expected to provide a tax benefit of Rs. 18,500 crore to an estimated 3 crore middle-class taxpayers comprising self-employed, small business, small traders, salary earners, pensioners, and senior citizens. Govt. had introduced a Standard Deduction of Rs. 40,000 in last year’s Budget, taking away some tax load from salaried taxpayers’ pocket. This year, this limit has been increased to Rs. 50,000. This will provide an income tax benefit ranging from Rs. 500 to Rs. 3,000 (excluding the impact of applicable surcharge and cess) to salaried taxpayers, depending upon the tax rates applicable to them. This proposal is expected to provide an additional tax benefit of Rs. 4,700 crore to more than 3 crore salary earners and pensioners. Current tax laws provided that if an individual had two or more house properties, he was liable to pay tax on rental income on the properties rented. Further, even if the house property was not rented and used by one’s family, tax was levied on notional rent which would have been receivable by him, had he rented the property. However, considering the practical difficulties for the individuals who may be using such house properties for their own use on account of their job, children’s education, care of parents etc., tax on notional rent on a second self-occupied house has been made exempt. It has been long demanded by the industry to levy taxes only on actual incomes, and not deemed incomes like notional rent on the properties owned. While presently notional rent on only one more self-occupied house property has been made exempt, it can be reasonably expected that this proposal may be the first step in the direction of making such notional income tax exempt. As per Section 194A of the Income Tax Act, banks/post offices are liable to deduct tax at 10% from the interest income payable to the depositors, if such interest income exceeds Rs. 10,000 for the year. This limit of Rs. 10,000 is proposed to be increased to Rs. 40,000. No tax will be deducted from the next year, if the interest income is less than Rs. 40,000. However, one thing that must be noted is that the exemption is only in respect of tax deduction by the banks etc. and the taxpayers will still be liable to pay taxes as may be applicable on such income. This move will help the small depositors, as they would not have to wait for the tax refund for the earlier tax deducted if their total taxable income was under zero tax regime as per tax laws. As per current tax laws, an individual could avail of tax exemption from long term capital gains under Section 54 of the Income Tax Act, if the sale proceeds were invested in purchase/construction of a residential house property. This benefit has now been extended to making an investment in two residential houses, instead of one, for a taxpayer having capital gains up to Rs. 2 crores. Such tax exemption can be availed only once in a lifetime. During his Budget presentation in the Parliament, FM compared this proposal with the idea of parents selling their old houses to purchase two properties for their children. Govt. has announced a farmer income support package, “Pradhan Mantri KIsan SAmman Nidhi (PM-KISAN)” programme for direct income support of Rs. 6,000 per year to farmer families, having cultivable land up to 2 hectares. This scheme is expected to benefit around 12 crore small and marginal farmer families. While the income support is being seen at the lower end, this will still cost the Govt. Rs. 75,000 crores in the next year. While the Govt. may have taken some time to realise the scale of the agrarian crisis in the country, this may be considered as the first small step in the right direction. Our farmers, feeding the entire country, deserve some special consideration for them in the times of need. Govt. has continued to stay committed towards Fiscal Responsibility and Budget Management (FRBM) Act, which sets the target of 3% of fiscal deficit to be achieved by 2020-21. Fiscal deficit for FY 2018-19 has been projected to be 3.4% of GDP, which is 10 bps higher than the earlier budget estimates. However, in the later media interactions, senior Govt. officials have indicated that the target of 3.3% of GDP may be achievable for the current year, on the back of higher GDP numbers. Fiscal deficit for the next year 2019-20 is also being projected at 3.4%. However, there are certain optimistic assumptions pitching revenues higher and any complacency may derail the fiscal consolidation path. Source: Disinvestment data on the website of the Department of Disinvestment and Public Asset Management (DIPAM). As can be seen from the above data, 70%+ of this has been contributed by ETFs, CPSE ETF, and Bharat-22 ETF, as the listing plans of unlisted CPSEs may not have taken off as expected owing to the subdued sentiments in the equity markets. However, the budgeted estimates have been left unchanged, signaling that the Govt. is still confident to meet the target. The next year target has been set at an even higher figure of Rs. 90,000 crores. As such, the capital market activity is likely to continue in the next year as well. As mentioned in the Budget speech, 57 CPSEs are listed with total market capitalization of over Rs. 13 lakh crore, and with an ambitious disinvestment target next year as well, many unlisted CPSEs can be expected to be listed soon including few CPSEs in railways, defence, and insurance sector. The Finance Minister has also hinted upon some relief on tax front in the Main Budget as well, but that will be for the new Govt. to decide. This Budget was the one for the common man and the farmer. Let us hope the coming budgets too continues to address the concerns in the economy, in whatever pockets they arise.